Preheat the oven to 400 degrees. Grease a 13×9 baking dish. 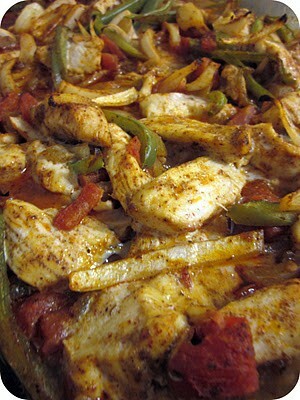 Mix together chicken, tomatoes, chilies, peppers, and onions in the dish. In a small bowl combine the oil and spices. Drizzle the spice mixture over the chicken and toss to coat. Bake uncovered for 20-25 minutes or until chicken is cooked through and the vegetables are tender. Serve with warmed tortillas and enjoy! !